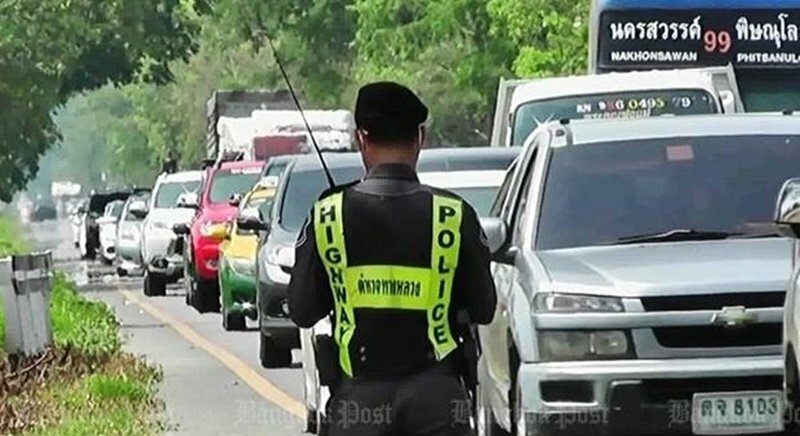 NATIONWIDE: Traffic laws will be strictly enforced over the Songkran festival as road safety measures are being stepped up nationwide from today (Apr 11) until Monday (Apr 17) in a bid to reduce accidents and fatalities, the government said. Interior Minister Gen Anupong Paojinda kicked off a road safety campaign yesterday (Apr 10), marking the so-called “seven dangerous days” of the Thai New Year festival. More security checkpoints will be set up to encourage motorists to respect speed limits, avoid imbibing and show consideration for other drivers, he said. Drunk drivers will be detained and their vehicles impounded, at least temporarily, he said. District Office Chiefs, kamnan and village heads are responsible for implementing the road-safety measures on their turf during the festival, he said, adding that major accident spots have been identified nationwide and special attention paid to them. Meanwhile, Deputy Prime Minister Wissanu Krea-ngam asked the public to stay vigilant and report any law enforcement officers who abuse their authority by demanding bribes from motorists. “We only want the police to stop cars and warn passengers sitting in the back of trucks if they spot any unsafe behaviour,” he said. This includes sitting on the side of a pickup truck bed while travelling, and drinking alcohol while in the back of the truck, he said. Prime Minister Prayut Chan-o-cha called a meeting with the national police chief and other officials yesterday morning and stressed the importance of relaxing certain traffic regulations until the end of the festival for the convenience of motorists. Previously, the government found itself in hot water after it introduced new traffic rules that prohibit people from sitting on the trays of pickup trucks. Gen Prayut became the target of criticism after the stiff safety measures were issued under Section 44 of the interim charter that grant special powers to the PM. He later apologised to the public for any inconvenience the ban may cause and deferred the rules to after Songkran. Mr Wissanu said it was important to balance safety and convenience. As the clock ticks to Songkran, which falls on Thursday (Apr 13) but the festivities of which last for several days, crowds loaded with gifts were already massing at Mor Chit Bus Terminal in Bangkok. Noppharat Karunyavanich, Executive Vice President for bus operations management of Transport Co said 136,340 passengers left Bangkok on Sunday for the provinces, while from yesterday to tomorrow (Apr 12) 1,500 additional trips will be provided by the company and its concessionaires. Normally, only about 6,500 bus services are operated per day, he said. Naras Savestanan, Director-General of the Probation Department, said an extensive public campaign will be carried out during Songkran to raise public awareness about the punishments dealt out to those caught driving recklessly or under the influence of alcohol. Over the past year, the department has asked the court to consider ordering traffic law offenders to serve at least 48 hours of community service, he said, adding that the period of service should vary according to the nature and severity of the misconduct in question. So far, 6,750 people convicted of breaking the traffic law have fulfilled the required punitive community service at hospital emergency wards and mortuaries, while 4,325 others did so at hospital in-patient wards, said Col Naras. BenPendejo...if you read the article it states, "...Mr Wissanu said it was important to balance safety and convenience." pretty much a common sense approach.